TRADITIONAL NAMES: Mauku Mārōki‘aki‘a (RR), Matie Tūtae-kuri (AT), Matie (MK), ‘Ātangaroa (MT), Mauku (TS TW), Mauku Vai-rakau (MH), Vayavaya (PK); Other Polynesian - Ta‘ata‘a (SAM); COMMENT: Mārōki‘aki‘a means stubborn or hard. ‘Ātangaroa, after God of small plants, because it is very persistent. 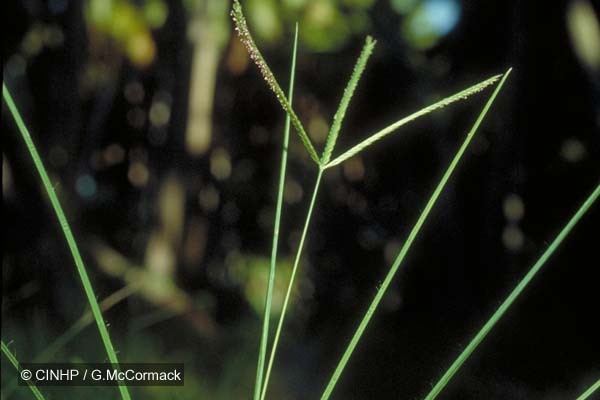 KEY FEATURES: Tufted annual grass to 50cm. Flower racemes pattern distinctive: to 7cm, 2-6 terminal, radiating, with ±1 2-4cm below the others. Leaf-blades with sparse long-hairs (to5mm), basal-joint yellow. NEGATIVE SIGNIFICANCE: Weed - moderate. Comments: A very tough grass, often on the edges of roads and tracks. Pukapuka: fieldspecimen, 2/2004, G.McCormack with ID as Eleusine indica.